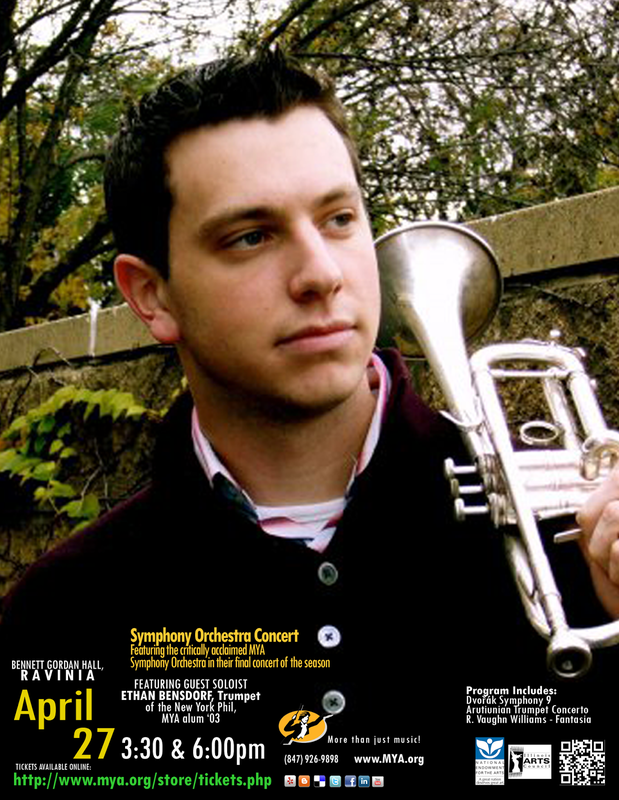 Ethan Bensdorf (MYA '03 Alum) will solo with Symphony Orchestra in two concerts at Bennett Gordon Hall on Sunday, April 27. Tickets are available at the door or can be purchased on-line. We recently communicated with Ethan. You might find his answers interesting. What is your favorite aspect of working for the New York Philharmonic? I remember listening to recordings of the New York Philharmonic, and thinking of the players in the orchestra as celebrities. Never in a million years did I ever imagine I could actually be a part of this great institution. Now, all of a sudden, I am physically sitting next to, and making music with these seemingly fictional characters who I have idolized since I was a kid. I literally have to pinch myself every once in a while to make sure it's real. Tell us about what you did to get to the New York Philharmonic? There is obviously a lot of hard work that goes into audition preparation, but it isn't just about the amount of work, it is about the efficiency of the work. Especially for us brass players, we can only physically put in a certain amount of time on the horn before our chops start to give out. In order to maximize practice efficiency, I make sure that I am always an active listener. I try to really hear what comes out the other end of the bell, not just what I think I am doing internally. I keep asking myself if what I am trying to do actually translates through the instrument and out the other end for the audience to hear as well. In addition to the physical practicing, I remember doing a lot of mental preparation for the audition as well. I made sure I listened to recordings so that I really knew each piece I was working on, and not just the excerpts listed. There is no way to play a perfect audition, and I never strived for that. So many players come out of auditions proudly because they didn't miss any notes. For me, it is always about the music. I would go in there and try to play my best; good sound, good rhythm, good articulation, good intonation, etc. If I really believe in what I am playing from a musical stand point, then the audience would have a better chance in believing in me too. What advice would you give to students who might want to follow your career path? As I wrote above, don't strive for perfection. I know that sounds silly, but in reality, there is no such thing as perfection. We all got this far because we love music. It is important never to stray from the roots of why we started playing, and why we have continued for so many years. Obviously it takes a lot of hard work to make it to "the big leagues", but that is the same in any field. What makes our situation unique is our creative souls. We get to tell stories every day with our instruments. Because of that, it is always important to play from the heart, play with conviction, and follow your dreams. Anything is possible, except perfection. What do you think about the piece you are playing with MYA? Have you ever played it before? The last time I played the Arutunian concerto was on my last orchestra concert at ETHS. I was terrified. I had never stood in front of an orchestra before, and I remember quite literally shaking in my boots. I remember telling myself to immerse myself in the music in order to calm my nerves. And there is plenty of great, passionate music in the piece. That is the only thing that got me through it. It didn't seem like it at the time, but playing that concerto was one of the best things I could have done for my trumpet playing. As with most things, the more you do something, the easier it gets. It is important to consistently push yourself. That is how we grow. My job is a constant reminder of that. Every week brings a new challenge, which I am forced to meet, and I have grown tremendously over the years because of that. I am definitely looking forward to the challenge of playing this piece again!